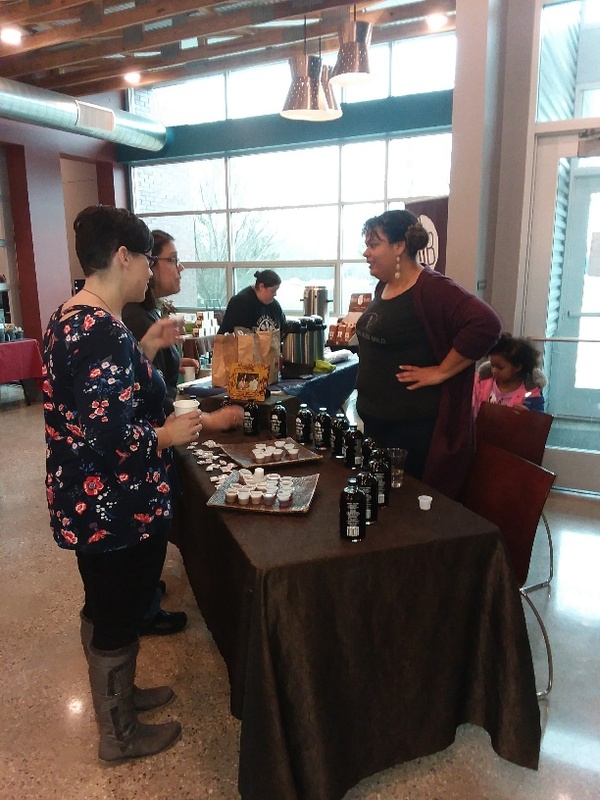 SMEDA's second annual coffee tasting fundraiser was Saturday, February 24th at WMU's Wesley Foundation. 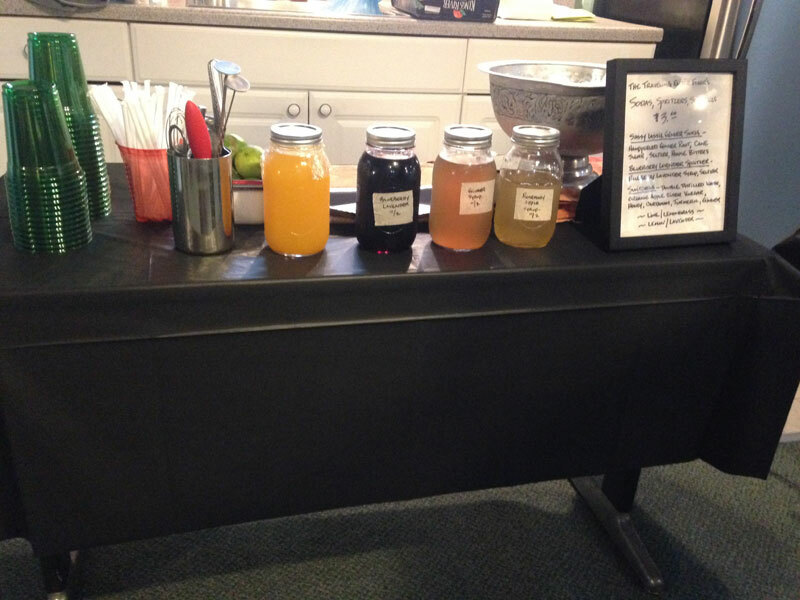 Water Street Coffee Joint, MamaleeLu Cold Brew, Ron’s Beans, Java Jones, and Coffee Rescue shared coffee and ChocolaTea provided three tea options.Special brunch items were provided by The Campus Beet. Here Come Treble aCappella provided musical entertainment. All funds raised will support better treatment and outreach for people suffering from eating disorders in southwest Michigan. 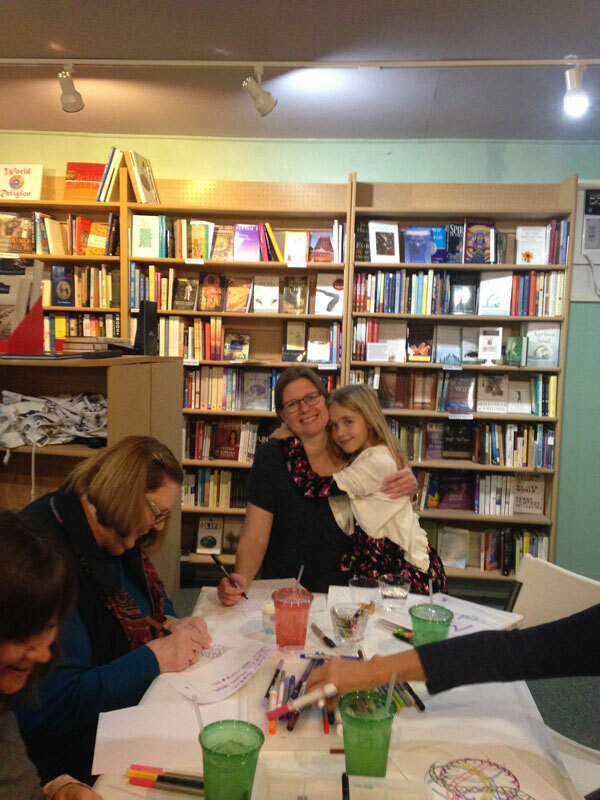 Gloria Tiller interviews Angela Morris about the Coffee + Compassion fundraiser. 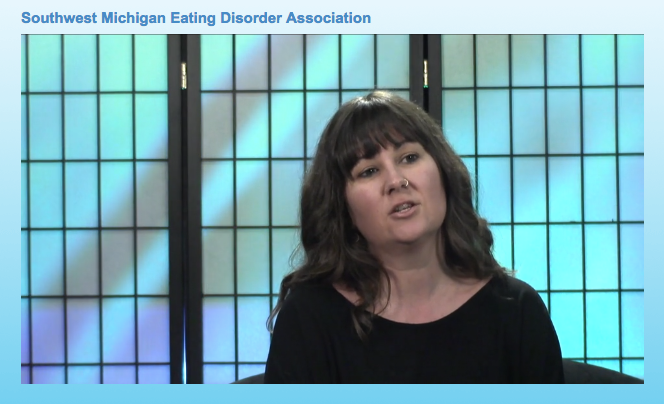 Kristin Fiore discusses Eating Disorder Awareness Month on Kalamazoo Community Spotlight. A showing and discussion of the movie, To the Bone. 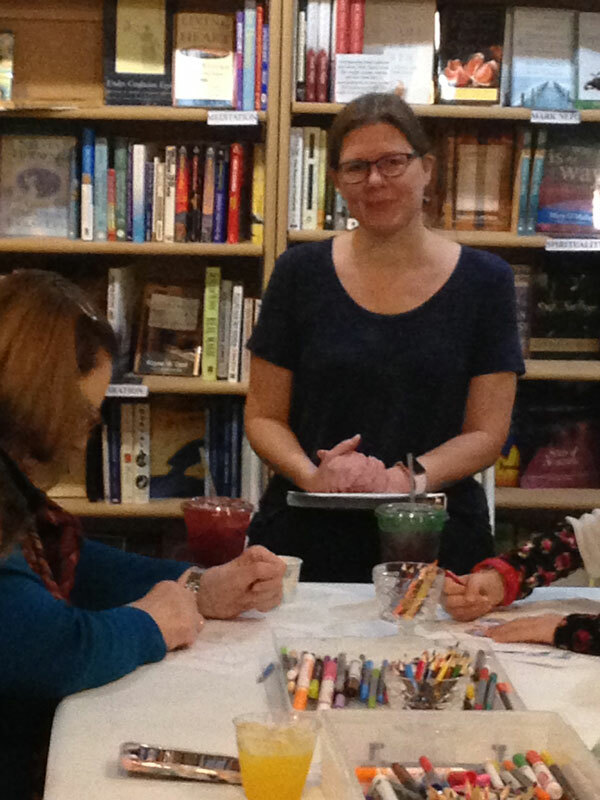 Thanks to Heidi M. Limburg, Angie Jackson, The Elixir Fixer, and our hosts, Kazoo Books. On Wednesday, February 22, 2017, SMEDA members Jillane Moffit, Emily Marr, and GVSU student Carielle Nikkel visited legislators at the state capitol. Kalamazoo Representative Jon Hoadley introduced the resolution at 1:30 am Thursday morning. 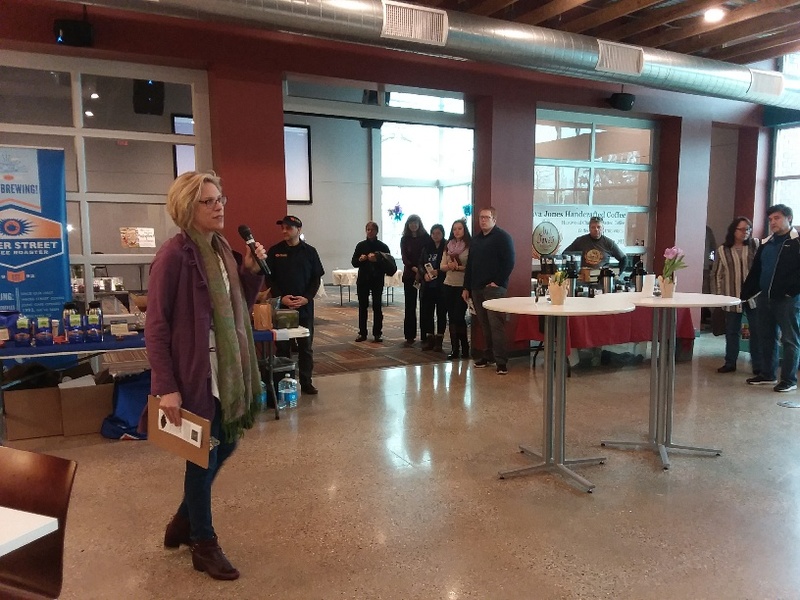 SMEDA presented a coffee tasting fundraiser at Riverview Launch on Saturday, February 11th. Water Street Coffee Roasters, Mamaleelu, Java Jones, Ron's Beans, and Chocolatea presented a selection of coffees and teas to go with food provided by Earth Fare, Food Dance, Organic Gypsy, People's Food Coop Sawall Health Foods, Target, and Tim Hortons. A silent auction with nine themed gift baskets gave coffee and tea lovers the chance to take home a gift for a special Valentine or for themselves. Reporter Becky Kark interviews dietician Susan Katz-Scheinker and yoga instructor Kristin Fiore about eating disorders for the St. Joseph Herald Palladium. SMEDA members and friends presented Eating Disorders Exposed, an art therapy exhibit that explored the topic through the eyes of those who have been experienced the impact of eating disorders at WMU Homer Stryker M.D. School of Medicine from 5 to 8 p.m. on Friday, February 3rd. Click here to see the art work. Click here for WMU Map. 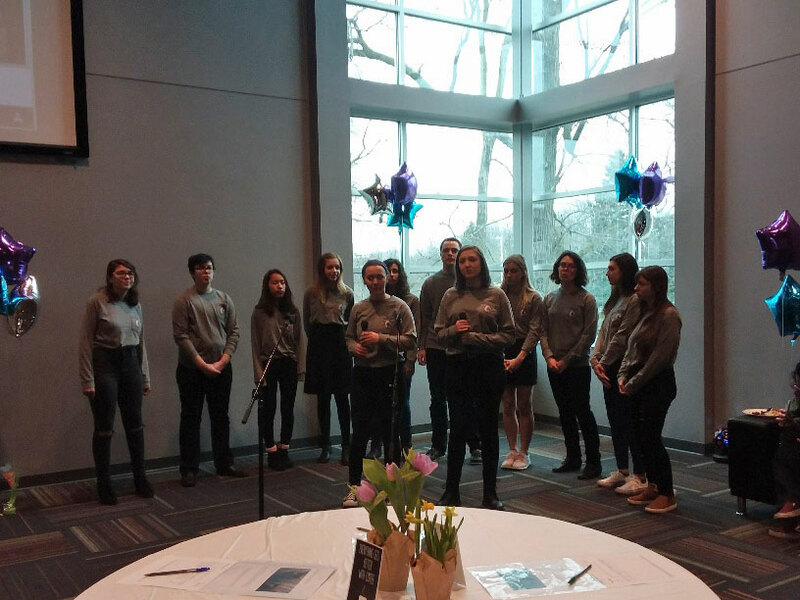 Students at Western Michigan University presented Food Prisons, a musical play about body image and eating disorders examining the life we lead when we're obsessed with food and how we look in today's society. The original play was written and directed by Christine Iaderosa, Coordinator, Theater for Community Health with music composed and directed by Adam Schumaker. On Friday, October 14th, SMEDA members Lindsay South, MA, LPC,RPT, Deb Frisk, MS RD , Kirstine Gibson, MD, Sheryl Lozowski-Sullivan PhD,LP, MPH, Angela Morris, Cathy Cook MA, TLLP, LLPC, RDN attended the Annual Conference on Eating Disorders in Ann Arbor. SMEDA members can access the handouts here. 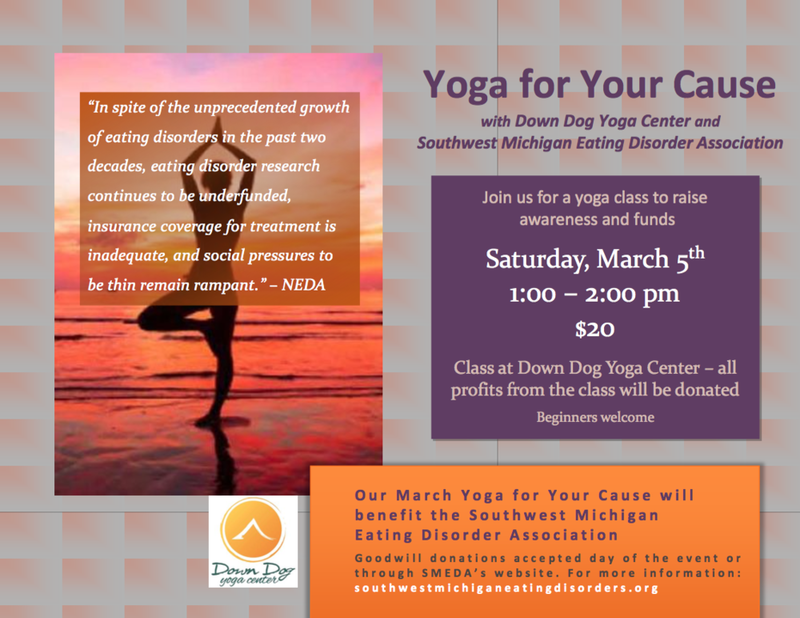 Down Dog Yoga Center sponsored a fundraiser for SMEDA on Saturday, March 5th. 1. Per Gail Hall: On June 24, 2016 there will be an Iaedp seminar in Grand Rapids at Meijer Gardens. More details to come. 2. Per Representative Jon Hoadley: A Resolution passed in the House of Representatives that officially recognizes Feb. 21-27 in Michigan as Eating Disorders Awareness Week. 3. Well of Grace Ministries is starting a binge eating disorder support group for women. It might start next month and will meet every other week on Tuesday evenings for 1.5 hours. On Sunday, February 21st a brave group of bikers hit the road on a cold but sunny day to raise awareness and funds on behalf of SMEDA. Riders started and finished at Sawall Health Foods in the Oakwood Plaza. Representative Hoadley, District 60, sponsored a resolution in the House of Representatives to recognize National Eating Disorder Awareness Week for the purpose of raising awareness of eating disorder illnesses. Click HERE to see the resolution. Woman's Life Chapter 831 of Richland sponsored a Wine Tasting to benefit SMEDA at Karen Theisen's Gull Lake home. Members brought hors d'oeuvres to pass.